A cat with a sensitive stomach can cause big headaches for you as an owner. Our research and experience points to Royal Canin Digest Sensitive Gravy as the answer to our prayers. Worrying that your cat isn’t eating right is one of the most common causes of anxieties in cat owners. If you find your cat is struggling to keep their food down, or isn’t eating enough, it may be time to explore some other options. Transitioning to one of the best cat foods for sensitive stomachs can really make a difference to both your cats’ and your own happiness. Although foods for cats with sensitive stomachs generally aim to contain less of the nutrients cats struggle to digest, they do vary significantly, along with your cats’ individual sensitivities. 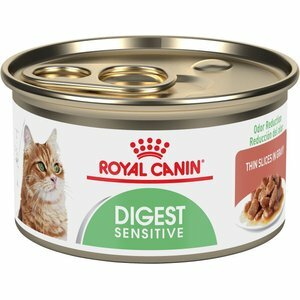 As a general pick, we found Royal Canin Digest Sensitive Gravy to be the best cat food for sensitive stomachs. Remember that your cat’s sensitivity could be caused by anything. They may be particularly sensitive to grains, or even high levels of taurine (something that cat’s do need in their diets). If you have concerns about your cat’s eating habits, you should always prioritize a trip to the vets. They’re the only people who can reliably guide you towards the root cause of the sensitivity. 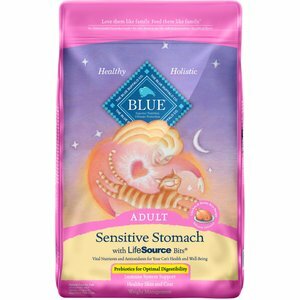 If you’re looking for some options for sensitive stomach cat food though, we’ve got you covered. Here’s a table with a few of our top picks, with the calorie counts and protein content listed for each. 7 How can a sensitive stomach cat food help? 8 What to avoid feeding a cat with a sensitive stomach? 9 How do I stop my cat vomiting after eating? 10 What else can I do for a cat with a sensitive stomach? If you know the cause of your cat’s sensitive stomach, great, you already know what to look for. If not, then stay with us and we’ll discuss some of the common causes of sensitive stomachs in cats a little further down. Now that you’ve seen a quick overview of the products we recommend, it’s important you hear about each in a little more detail. Here are our 5 best cat foods for sensitive stomachs, each with their own little benefits. Royal Canin are much loved by experts and professionals for their amazing formulas that balance high quality ingredients and wholesome nutrition. Designed entirely for cats with sensitive digestive systems, this wet cat food provides a 100% complete nutritional diet. Take a quick look at the protein to content ratio and you’ll soon realize that no other cat food manufacturer comes close to such an impressive contrast. This cat food promises the perfect macro-nutrient profile, meaning that fats, proteins and carbohydrates are uniquely balanced to provide your cat with a meal that’s both delicious and agreeable with their tummies. The special digestion formula also works to reduce stool odors and support an ideal weight. It’s highly palatable and as a result, our two cats are mad for the stuff. We’ve never been able to find a cat food that beats Royal Canin for quality in almost any department, and food for sensitive stomachs is the same story. We can’t recommend this food highly enough, we know how worrying it can be watching your cat vomit after almost every meal and the results we saw when switching to Royal Canin were super impressive. We’ll prefix our review of BLUE Sensitive stomach with a quick notice. If you think grains are the cause of your cat’s digestive troubles, then you should prefer a wet cat food, or a more suitable dry cat food instead. This food does contain grains, it’s not a bad thing in all cases, but if your cat has shown sensitivity to foods that contain whole grains then you’d probably be wasting your time and money trying another. With that out of the way, this is a great dry cat food for sensitive stomachs. There’s no by-product meals, meaning you get really high quality meat proteins (32% minimum!) and a whole host of minerals and antioxidants that support your cat’s immune system. Blue buffalo have a great reputation with cat owners for producing a wide range of delicious foods at very reasonable prices. This is no different. The deboned chicken pieces drive cats wild, and there’s no corn, wheat or soy products included to minimize any potential upsets. 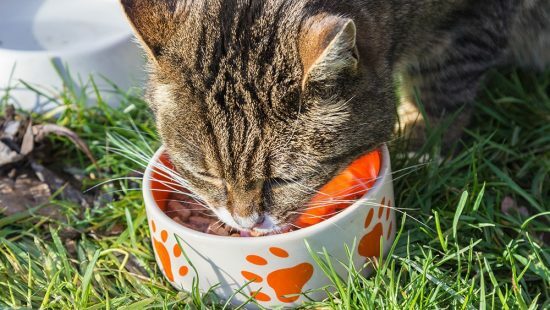 Although we’d probably prefer a wet food over a dry one for a sensitive stomach, this is a perfectly viable option for cat owners who prefer to feed dry food. Just make sure your cat is properly hydrated at all times to improve digestion. Another Royal Canin wet cat food! This loaf in sauce variant of the chicken recipe featured above is fantastic for cats who are frequently sick due to rushed eating. The different texture that the loaf provides stops cats guzzling their food and causing digestion issues. It also makes for a great bit of variation in food type to make things a little more exciting for your cat. It’s relatively low calorie count is also fantastic for cats to maintain a healthy weight, something which can also have a positive impact on their eating habits. You get the exact same level of nutrition and highly digestible proteins that are perfect for cats with sensitive bellies! This high quality wet cat food could be the solution to your worries. We’d recommend you introduce it gradually alongside a food they’re familiar with. The change in texture can sometimes throw cats a little if you straight swap from one type of food to another. Another well known brand, another excellent cat food for sensitive digestive systems. Purina always produce a very high standard of cat food and we’re pleased to see they’ve made one especially for sensitive stomachs. The clue’s in the name for this one. 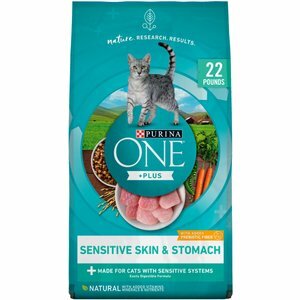 Purina’s specially formulated “Sensitive Systems” cat food provides a wide range of minerals and vitamins that boost digestion and your cat’s immune system. Because it’s from a well known brand, you get high quality nutrition and a food that’s significantly cheaper than any prescription alternatives. It’s a wonderfully balanced option for those who prefer to feed a dry food, and the number one ingredient is real turkey. We’ve heard plenty of stories of owners finally seeing success in preventing vomiting by transitioning to this adult cat food, each of which now deem it the best cat food for stopping vomiting ever. 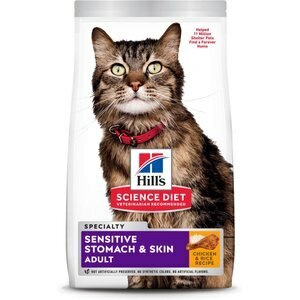 Last up we have Hill’s Science Diet Sensitive. We don’t need to go into detail about the Hill’s brand, since we’re sure you’ve heard all about them by now (if you haven’t, where have you been!!). They’ve produced another excellent cat food, and as a result it’s earned a space on our list of cat foods for sensitive eaters. Packed with a proven antioxidant blend and vitamins C and E, it promotes healthy digestion and settles upset tummies. It’s omega-6 fatty acid content also promotes good coat and skin health, so you get more benefits for your money here. Hill’s 100% money back guarantee means you can try this food risk free. If they’re that confident in it’s abilities then we think that speaks volumes about the quality of the food itself. They have an excellent reputation for science backed foods that offer wholesome nutrition and tackle common complaints with cats, this one’s up there with the best of them. Cat foods for sensitive stomachs have been carefully crafted to reduce the risks of negative reactions and subsequent vomiting. Because of the risk of stomach upset, they usually shy away from containing by-product meats as protein sources. By-product meats aren’t bad for your cat, but with cheaper foods and brands, the sources are sometimes questionable. Sticking with a well known brand results in all round better quality cat food that’s far less likely to cause aggravation to your cat’s digestive system. As well as this, most of the best cat foods for sensitive eaters avoid corn and other grain based ingredients. Although grains aren’t necessarily bad for your cat’s health, they aren’t a required part of their diet and the inclusion of grains and carbohydrates in cat food can often lead to irritation. If you have reason to believe grains are the reason for your cat’s stomach upset, you should consider wet foods rather than dry. 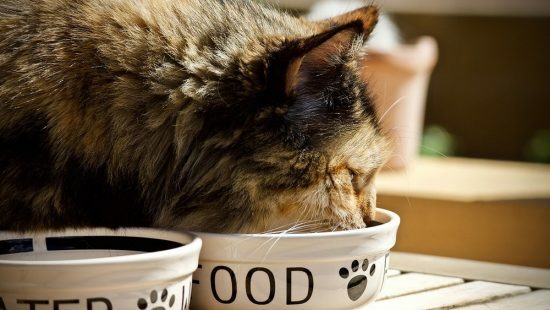 Providing a meal specially designed for cats with sensitive stomachs can work wonders to restore a healthy eating routine and a better quality of life. 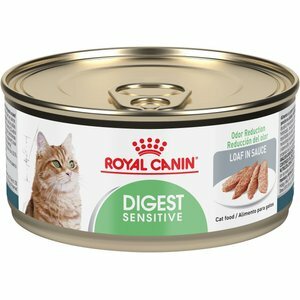 What to avoid feeding a cat with a sensitive stomach? Firstly, this largely depends on the individual sensitives your cat has. This can range from a cat experiencing issues because of excessive dairy consumption (milk, cheese, etc) to a cat that flat out rejects grains and wheat. Your cat could even have trouble digesting a single coloring or additive, and throw up because of it. As previously mentioned, any concerns about your cats eating habits or sensitivity to common cat foods should be raised with your vet. They can help you discover the cause of the issue and give you advice on what to try next. For the most part though, avoid things that aren’t necessary in a cat’s diet if you aren’t sure what the cause is. Carbohydrates, though not at all harmful by themselves, aren’t a natural part of a cats diet. It’s gruesome to think about but the only carbohydrates wild cats ever consume comes from the contents of their prey’s stomach (eeew!). If you’re extraordinarily patient, you can gradually re-introduce certain ingredients that you’ve removed from their diet in order to discover the cause of the intolerance. Along with a sensitive tummy, rushed eating can also lead to undesired side effects such as vomiting and diarrhea. 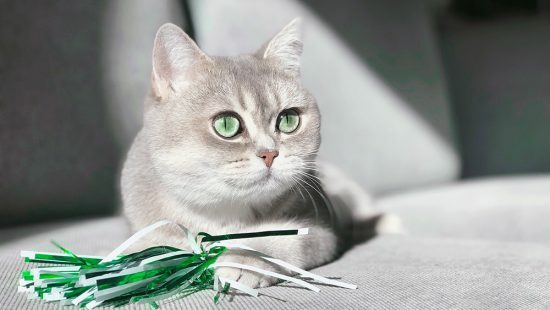 To combat this, you’ll want to keep a close eye on your cats eating habits. As you transition to a cat food for sensitive stomachs, you may also want to make a shift to smaller portion sizes. If you’re guilty of not monitoring portion sizes (most cat owners are!) then you should read up on recommended portions on the manufacturer’s website. Armed with that knowledge, you can even invest in an automatic cat feeder that will handle portion sizes for you. Smaller portion sizes coupled with a transition to a cat foods for sensitive stomachs should at the very least give you some indication of the cause, if not solve it completely. If your cat has frequent hairballs, then a sensitive stomach may not be the cause of vomiting after all. You can groom your cat to reduce the chances of hairballs, and even look for foods that specialize in reducing them. Remember to try different things gradually. Never swap out a cat’s diet entirely without a transition phase. Most experts recommend a transition phase of around a week at minimum. In food terms, you could transition onto the new food by mixing 20% of the new food in with 80% of the old. Gradually make your move until you reach 100% of the new stuff. What else can I do for a cat with a sensitive stomach? It can be super frustrating not knowing how best to help your cat. We can’t stress the importance of professional veterinary advice, but here are some tips that may ease things. Our first recommendation would be to ensure that they’re getting enough water. Cats that eat primarily wet food are usually okay in this department, but it doesn’t hurt to have fresh water lying around at all times. Those who feed dry cat food will need to be a bit more focused on their cat’s drinking habits. Try a cat water fountain if your cat doesn’t seem that interested in their bowl. These help by drawing cats in with a slight trickle sound, and keep water oxygenated and fresh for up to a week at a time. If you provide your cat treats, try ruling them out as the cause of stomach sensitivity. You could have the most gentle sensitive stomach cat food in the world, but a handful of rich treats a day would still cause upset. Treats should never make up more than 10% of a cat’s daily calorie intake, so be double sure you aren’t guilty of going a bit overboard with these. Cats look pretty chilled out, but there are many environmental factors that can cause stress and upset your cat’s eating habits. 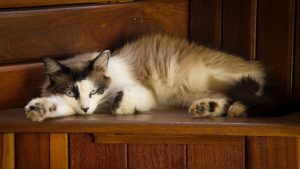 If your cat has recently been fighting for territory, they may feel uneasy and unsafe eating if the food is right next to a door or entrance to the home. Place food and water in an area that isn’t frequently disturbed, preferably near some toys that they feel comfortable around. This should help put their mind at ease and let them enjoy their food without worry.